Thi Bui is an American kid born in Viet Nam. When the memoir opens, she's having her first child. As many parents will tell you, this is a time that often brings our own childhoods into focus. Her story is different from the stereotypical strict immigration story, and through the memoir we see that the family history is indelibly marked by Viet Nam's history and her parents stories are marked by their parents' stories. It's easy to get tied in a knot when we find fault with our parents. It's clear from her pictures and words that there was some anger and confusion exorcised by writing this memoir. While she may have been able to lay blame at one time, her title states her final view. It's Thi Bui's unique story with lots of room for empathizing readers. Her simple-yet-resonant art conveys the emotional impact of her words. The combination is effective and moving. I lingered over this book for weeks, searching the pictures and immersing myself in her story (until the library demanded I return their copy.) If you, like me, aren't comfortable with comics or graphic novels, this might be a place to start for those who like memoirs or history or both. I now own three copies: one hardcover, one kindle and one audio - which is completely lovely and well worth the donation (ALL PROCEEDS GO TO CHARITY!) After reading and listening to the audio, I've ordered 5 more copies for children I know. It's a very appropriate children's book. Common Sense Media, an independent non-profit organization helping parents make media choices for their children, gave the book a four star rating and considers it appropriate for children of four years and older, giving it its highest marks for "positive messages" and "positive role models and representations." Written by Jill Twiss (with an assist from Marlon Bundo) and illustrated by EG Keller (aka Gerald Kelley) about, well... a in the life of Marlon Bundo, the real-life rabbit of the Pence family. You might know the Pence family because their dad is Mike: Vice President of the United States. The pictures are really adorable and it's actually just a very lovely story about everyone being different and that's awesome. Also, it's nice to hop together rather than alone. And animals make a perfect bridal party -- I learned a lot! 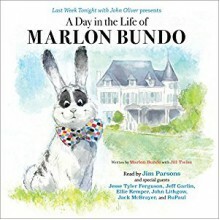 In the audio version Jim Parsons plays Marlon Bundo, John Lithgow plays the evil stinkbug (not too scary for kids, but scary enough) and tons of other lovely voice acting in this short children's book from the likes of Jesse Tyler Ferguson, Jeff Garlin, Ellie Kemper, Jack McBrayer, and RuPaul! What a fun little book. Linked short stories all from "Deadtown" where we are shown around and introduced to the Hell Hath Club by its president Paige Embry. Being president means Paige gets to the Lethe Café early to hold the table while she passes the time drinking ristretto pulled cups of nothing. Each of the members of the Hell Hath Club tells her story. They are superheroes, partners of superheroes, villains or partners to villians, a sea princess; you get the drift. The writing is laugh aloud funny at times. All of the characters are "very beautiful and very well-read and very angry." This makes for snazzy dialogue and funny lines, driven home by occasional black and white drawings. Though they were extremely original and not repetitive in content, it was the form perhaps that bored me? We knew everyone would die, after all. I usually quite like short stories, but this was a take it or leave it read for me. ... but I should have. Instead I have watched the movie Life. If you don´t know that movie, it´s the one were Ryan Reynolds, Jake Gyllenhall and others are acting like complete morons, even though they are supposed to be scientist. These idiots picked up an ancient life form from Mars, whose main objective is to kill them all (and to get to earth). Due to the stupidity of the astronauts / scientist and the survival instict of the alien, all hell breaks loose on the ISS. Honestly, I cheered for the alien, which is so wrong because it was so boring and non-threatening. The people in this movie were just so dumb, I was on the verge of throwing stuff at my tv and don´t get me started on the ending. I hated the ending. 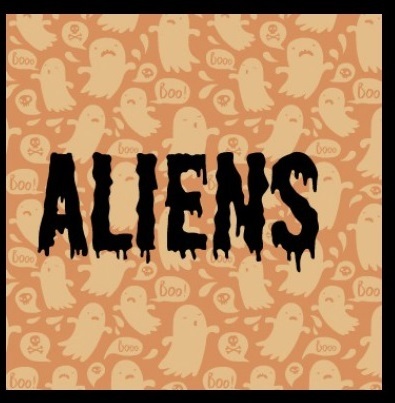 Coming back to the one and only Alien, the real deal, threatening in all it´s glory. I´m reading the graphic novel for the halloween bingo. The story takes place after the event of the James Cameron movie Aliens, Newt and Hicks have survived and are forced to go after the Alien again. I´m about halfway through and I´m enjoying the story and the artwork with its drawings in black and white.